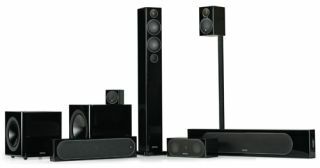 Monitor Audio launches new Radius Series speakers and Radius One soundbar | What Hi-Fi? Monitor Audio has revealed details of its new Radius Series speakers, bringing new versions of the popular Radius 45, 90 and 270 (above) speakers, plus a new 200 centre, re-engineered subwoofers and a Radius One soundbar. The new Radius speakers, which are set for release this September, come with new all-metal driver configurations and C-CAM bass drivers and tweeters. The 8-strong line-up in full is: Radius 45 "super-compact" bookshelf speaker, Radius 90 compact speaker, Radius 225 LCR, Radius 200 centre, Radius One soundbar (below), Radius 270 floorstander, plus the Radius 380 and Radius 390 subwoofers. Monitor Audio says the main changes will come from the new metal drivers, which sport C-CAM material bass drivers and a new 25mm tweeter – technology originally found on the Platinum and Gold GX speakers. MA promises the new drivers will help deliver speakers with a cleaner and more accurate sound. The new Radius 225 LCR offers a slimmer centre speaker than MA has delivered before (40% slimmer than its predecessor, the 225HD), with both this new centre and the Radius One soundbar coming in at just 65mm in depth. Both can be happily wall-mounted as a result. The soundbar sports three identical channels – 3x bass drivers and 3x tweeters – and comes in black, walnut and white finishes. • Configuration remains similar to its predecessor. • New ultra- compact ‘cube’ shape high performance subwoofer. • New compact ‘cube’ shape high performance subwoofer. • 220 watt class D amplifier with DSP. The new Monitor Audio Radius speakers are set for release this September and we will have a review of the new R90HT1 5.1 surround sound speaker system in the October issue, out August 28th.